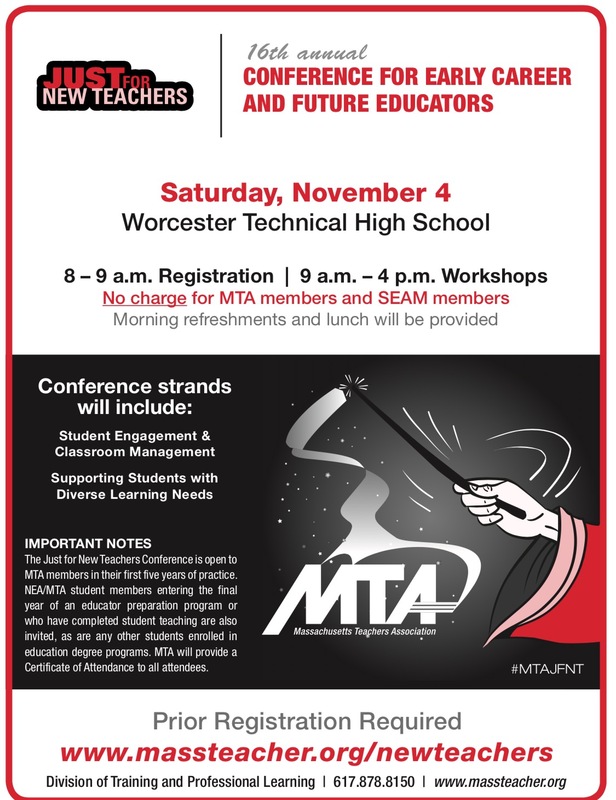 The New Member Committee is pleased to announce the 16th annual Just for New Teachers (JFNT) Conference, to be held at Worcester Technical High School on November 4, 2017. JFNT provides new educators in their first five years of practice the perfect opportunity to meet with fellow educators and get advice on best practices in teaching all grade levels and subject areas. More than 20 member-led workshops will address a range of topics on Student Engagement, Classroom Management and Supporting Students with Diverse Learning Needs. For the first time, this conference will be free of charge to MTA members. Members who register by October 18 will receive a personalized gift at the conference. Welcome back New Bedford educators!